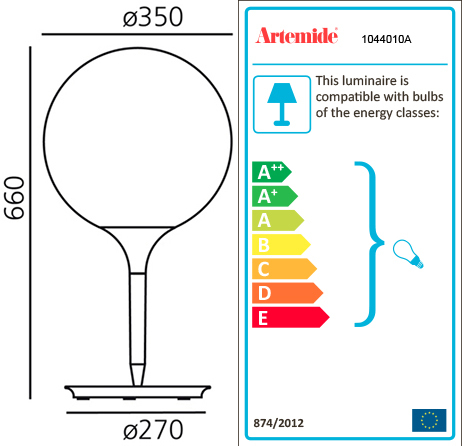 ARTEMIDE CASTORE is a table lamp. The spherical diffuser design is enhanced by a removable-fitting and tapering luminous stem, that makes the transition from the strong diffuser light to the blind lamp structure area gentle. Base in zamac, stem in thermoplastic resin, blown glass diffuser. Touch dimmer button on the lamp base for the storage of the latest light intensity set-up or the use of a local or remote control (controlled socket) . With dimmer. Bulbs not included, 1x150W Halo o 1x21W LED DIM (E27).